Making War at Fort Hood offers an illuminating look at war through the daily lives of the people whose job it is to produce it. 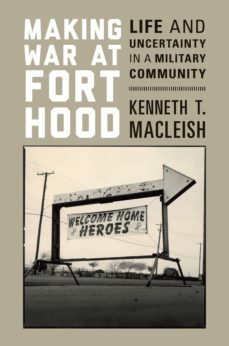 Kenneth MacLeish conducted a year of intensive fieldwork among soldiers and their families at and around the US Armys Fort Hood in central Texas. He shows how wars reach extends far beyond the battlefield into military communities where violence is as routine, boring, and normal as it is shocking and traumatic. Fort Hood is one of the largest military installations in the world, and many of the 55,000 personnel based there have served multiple tours in Iraq and Afghanistan. MacLeish provides intimate portraits of Fort Hoods soldiers and those closest to them, drawing on numerous in-depth interviews and diverse ethnographic material. He explores the exceptional position that soldiers occupy in relation to violence--not only trained to fight and kill, but placed deliberately in harms way and offered up to die. The death and destruction of war happen to soldiers on purpose. MacLeish interweaves gripping narrative with critical theory and anthropological analysis to vividly describe this unique condition of vulnerability. Along the way, he sheds new light on the dynamics of military family life, stereotypes of veterans, what it means for civilians to say "thank you" to soldiers, and other questions about the sometimes ordinary, sometimes agonizing labor of making war.Making War at Fort Hood is the first ethnography to examine the everyday lives of the soldiers, families, and communities who personally bear the burden of Americas most recent wars.